This petition has been created by Cockpit S. and may not represent the views of the Avaaz community. We, professional air pilots, are writing to you to draw your attention on the practice that consists in selling flight hours packages to both professional airline pilots and multi-pilot helicopter crews.Indeed, it is abnormal to have pilots invest vast amounts of money to fill their logbooks flying airliners while carrying passengers. And yet, upon buying a flight ticket, one can reasonably assume to be taken care of by professional pilots employed and paid by the company, however, such is not the case everywhere in Europe. Nowadays, one can find pilots paying up to sixty thousand euros (60.000€) for 500 flight hours on an airliner with 150 souls on board in the European Union. This practice of charging crews, also known as 'self sponsored line training' or 'pay to fly', raises concerns about the effective responsibility of professional pilots.Under normal circumstances, pilots are paid to be entrusted with the safety and efficient conduct of the flight. By reversing the cash flow, airlines are positioning themselves as service providers, thus reducing or canceling the liability endorsement of the pilot, causing implicit impact on flight safety. 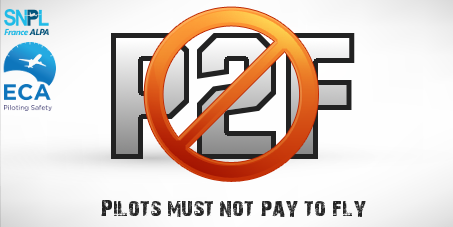 In this respect, 'pay to fly' was recently thwarted in the United States of America thanks to a Federal Aviation Agency regulation (FAA), which does not prevent companies like 'EagleJet' (flight hours provider based in Florida, USA) from keeping trading pro pilots to air companies operating... in Europe (such as Astraeus Airline, Wizzair , Strategic Airline to name but a few)! Airlines supporting this business allegedly see no conflict in selling hours to a pilot as the latter is said to do so to gain experience.This is but a poor excuse to reduce their operating costs by withdrawing their investment on copilots who are yet meeting Joint Airworthiness Requirements (JAR) - granting European licenses.In the meantime, thousands of qualified and unemployed European professional pilots are unable to find a job partly because, out of corporate greed, those airlines choose to use pilots who pay to work.It goes without saying if we continue to tolerate this abuse, soon air pilots pay grade will plummet below rational level, increasing safety issues and killing our profession.This is why, in the interest of European citizens, airline passengers and professional European pilots flying the European sky, 'pay to fly' must come to an end. In this regard, we, professional pilots, call on our European Commission to issue a legislative proposal on this matter that would prohibit commercial airlines and intermediary businesses from selling flight hours to professional pilots. If such request proved overambitious, considering its various national implications, we request airlines to disclose this practice in the most visible way possible so as to get passengers clearly informed they are selling flight hours to their pilots. We hope this petition will engage your attention and induce the commission to take adequate measures.